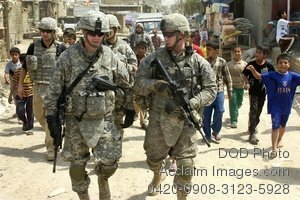 Description: Free, public domain image: Soldiers Patrolling a Street in War Torn Baghdad With Iraqi Children Following Them. Spc. Ryan Ringi (right), of Suffolk, N.Y., talks to Lt. Col. Michael Shinners, deputy brigade commander of the 3rd Brigade Combat Team, 82nd Airborne Division, Multi-National Division-Baghdad, during a foot patrol inside a market in the city of Shawra Wa Um Jidir April 4 in the 9 Nissan district of eastern Baghdad. Shinners, along with members of the embedded provincial reconstruction team and Paratroopers walked the market in order to evaluate the current construction projects in the area. The projects will help to improve the city’s economy and create jobs in the poverty stricken region.